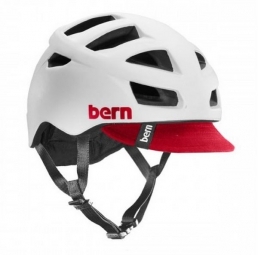 The Allston is the long awaited cycling specific helmet release from Bern, featuring over 50% more airflow with 16 strategically placed vents. We developed this helmet alongside the world's best cycle messengers, and cyclecross racers, which resulted with a helmet that performs as well as it looks. The Allston is made from Bern's exclusive ZipMold technology resulting in a high strength to weight ratio with a clean finish. All Bern Helmets with Intergrated Visors now have the ablitltly to flip.